The west was still wild or certainly looked a lot different when many of today’s cities and town ordinances were written to prevent having chickens in most urban environments. It was certainly common for many urban environments to prohibit any kind of poultry and agriculture and the general trend was to separate farming from the cities and town. Your backyard chicken coop maybe a first for your community and your city council so be prepared! Chicken laws and ordinances vary DRAMATICALLY from one city to the next. Just because your neighbor in city X who lives across the street can X number of chickens, you might be prevented from even thinking about chickens! Some cities require $50 annual permits and inspections. Many have these setbacks of 200 feet from your nearest neighbor.. which is hard to get when your lot is only 100×100 feet! So before you invest your last month’s paycheck into a coop, it’s best to find out what your city laws and ordinances say about backyard chickens. The Website BackyardChickens.com has a complete section on just California chicken laws and ordinances that lists many CA communities. Good News: It is usually fairly easy to find the rules on having backyard chickens in your city or county area if outside of a city and the rules are generally specific enough to see what you will be dealing with. There is a general trend in most cities and urban/semi rural settings to work with residents, change the rules and allow for small back yard flocks. Cities understand the importance of local, sustainability in our food system and there are many good ordinances being developed by cities and counties all over the country from which you can model new rules if needed. I started researching various cities bee ordinances a few months back and quickly realized that almost all cities and counties do an excellent job of posting their ordinances and laws on the Internet. There must have been some legal disclosure requirement as it appears there are websites separate from the town website that clearly list town ordinances. 1) So first figure out if you are under city/town rules or county rules for things like pets and animals. 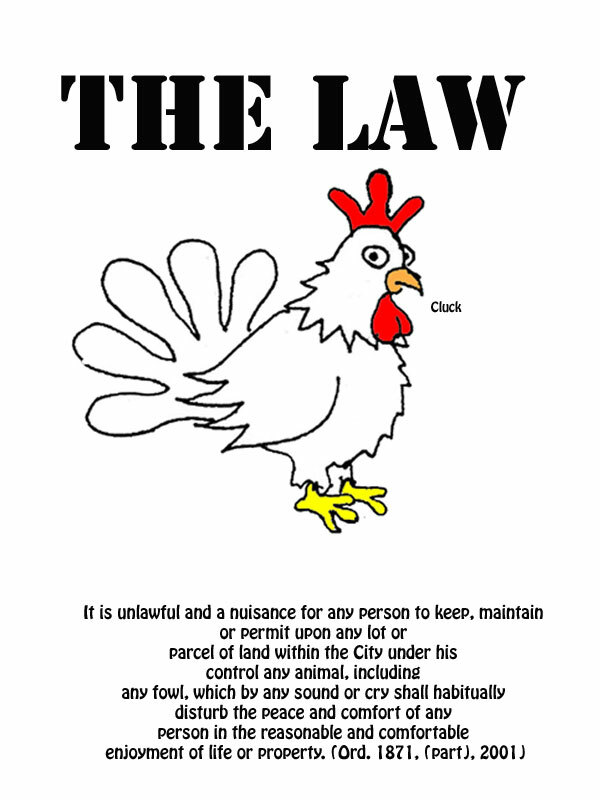 It is hereby declared to be a nuisance for any person or persons other than a licensed veterinarian and except as specifically provided in this Article, and it shall be unlawful to keep, maintain or feed within confined or unconfined areas live chickens, roosters over four (4) months of age, geese, ducks, turkeys, or similar fowl or rabbits; provided that a maximum of three (3) chickens or three (3) rabbits, or a combination thereof not exceeding three (3), may be kept, maintained or fed as pets within confined clean coops or cages. So this basically says you have can 3 chickens! You probably don’t want to read between the lines too carefully since many other urban backyard farming practices of compost, aquaculture, and beekeeping maybe prohibited but they tend to not to cluck! If you live in an city/town that prohibit chickens, don’t give up! Most councils might enjoy a bit of it’s residents getting involve to modify it’s town ordinances, especially in ways that promote a more “green” approach to city planning. You can write ordinances that can please almost any council member. These ordinances do get amended time to time, mostly from input from coopsters citizens like you!